1 Queen bed & 2 single bunks all made up. 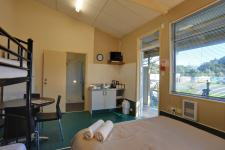 TV, Table & chairs, fridge/freezer, microwave, heater and kitchenette with sink and all cooking & eating utensils provided. Your own full-size bathroom.